First Col Ltd specialises in the provision of competent and reliable nurses, healthcare assistants and domiciliary care workers at affordable and fair rates. They have a reputation for delivering a fast, high-quality and helpful healthcare staffing solutions and services that meet the needs of busy healthcare providers at very short notice. This service is available 24 hours a day and 7 days a week. 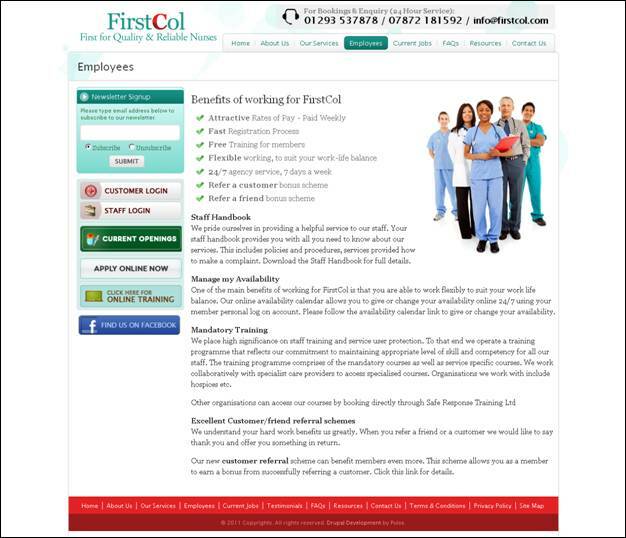 Pulse Solutions has successfully created a website that closely identifies with the quality of nursing services First Col represents. The website is dynamic with a full backend CMS to enable easy upgrades to the site. The system includes a login console for customers to make and review bookings, and a console for nurses to review the needs and apply to fulfil. This is an ideal platform for both the patients and the nurses to find each other.